When it comes to dressing I am all for affordable fashion that looks classy and expensive. So when I was recently sent a couple of pieces by DressLink I felt very lucky to be introduced to a brand that offers exactly this. 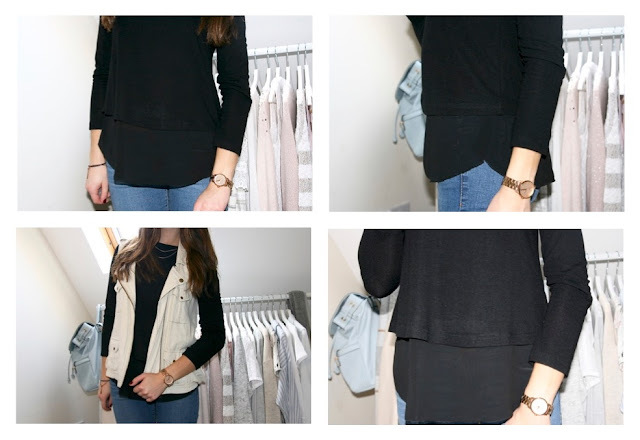 Somewhere that you are able to find a whole outfit for under £20! The first top that I chose what this long sleeved black jumper with a chiffon underlay. I never really used to wear a lot of black but recently I am coming to understand why it is such a popular colour. It feels so expensive and classic especially in the design of this jumper. I also love the grey and white style but I have so many grey jumpers I thought that I would try and branch out a bit! This jumper is perfect for this time of year and has the 3/4 sleeves which I find the most flattering style. The pictures in the bottom left shows how I styled this one day. Medium skinny jeans and a thin beige gilet with some gold jewellery. You can find this top on the DressLink website here. And it's less than £4! The second top is more classic Katherine, pretty, floaty and pastel! I love the shape and of course the gorgeous pleated detail on the back. As you can see in the last photo this top just makes me want to spin like a princess! I styled this top with some black skinny jeans and back heeled boots which I thought would be perfect for an evening out. I also put my hair in a low messy ponytail to add to the casual relaxed look. You can find this beautiful blouse here on the DressLink website for again less can £4! Hope you guys like these two tops and how I have styled them. Expect to see them again soon in some more outfit posts as I can't stop wearing both of these. And go and check out all the lovely affordable clothes on the DressLink website here.